As the United States presidential election season heats up, much of the press attention has been focused on the current Democratic frontrunner, Hillary Rodham Clinton. When Sen. Clinton ran for president in 2008, the press trumpeted the fact that she was a woman, as though she were the first to run for president. She was not. That honor goes to Victoria Woodhull, who ran for president in 1872 – a time when women didn’t even have the right to vote in the United States. While most schoolchildren are familiar with the name of suffragette and women’s rights crusader Susan B. Anthony, Victoria Woodhull and her many groundbreaking accomplishments remain largely forgotten. 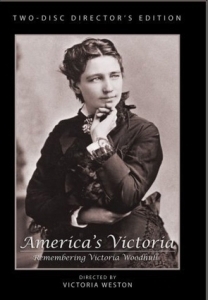 The PBS documentary “America’s Victoria: Remembering Victoria Woodhull” received widespread distribution on both the national and local PBS stations as well as Canadian Broadcasts. Although this level of distribution was gratifying, we recognize that young people do not consume content the same way their parents do. Today, Millennials prefer to get their information and entertainment from the Internet and, increasingly, from mobile apps. It is our intention to present the documentary on a more modern platform by creating an interactive educational iPad app that will provide key video clips featuring exclusive interviews with Gloria Steinem and respected historians. In doing so, we will be able to tell the story of not just Victoria Woodhull and her accomplishments, but help students understand how far women have come and inspire them to reach even higher to achieve their goals. Our small production team comprises of Victoria Weston, the writer, director and producer of “America’s Victoria.” As founder of Zoie Films Festival, Victoria utilized the latest streaming technology to launch the first online film festival showcasing films from around the globe. She’s also a developer and distributor of mobile apps. Based in Atlanta, Georgia, Victoria has been a interviewed by dozens of media outlets including; Atlanta Journal & Constitution, Atlanta PARADE magazine, ABC Talk Radio, CNBC, BUSINESS WEEK Online, Wired News and ABC’s NIGHTLINE.